I am not a cage fighter. I know one, though, and have seen him in action; felt the pulse of the audience. We even shot a movie together. Damn nice guy, but he takes AND delivers quite the beating with his mixed martial arts. My job, as a writer and observer, is decidedly different. His job, as a MMA fighter, is to get past the limits of his body; ignore the pain and keep pushing forward. It is something I could not do, not even with the right amount of training and punishment. And, yet, he does it and thrives in it. The fight is more than survival and, that right there, is exactly where Hunter, a new horror/thriller starring Justified and The Shape of Water’s Nick Searcy and Chicago Med’s Rachel Cerda, begins: survival. "Emotional, street tough, and blood-soaked in all its fanged fury, do NOT miss this new definition of a blood sport!" 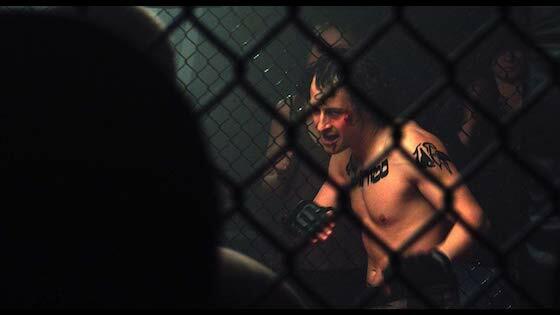 Hunter (Jason Kellerman, who also wrote the movie) is a cage fighter and, with one bloody beating after another, he is damn good at what he does. His fights are intense. And his opponents with their thick necks, their v-shaped backs, and their rock-solid legs are walking definitions of masculinity. Blood will spill in this ring. The audience can taste it. And, thanks to some tight shots, rapid edits, and a great feel behind the camera, we do, too. Hell, thanks to this visceral production we almost experience the adrenalin dump these fighters face. But the movie, with Chicago as an expressive backdrop, has so much more to offer viewers. I did mention that Hunter was a horror film and, once we move past the brutality caged inside the chain link fence, we see just how ugly Hunter’s life has become some seven months or so later. 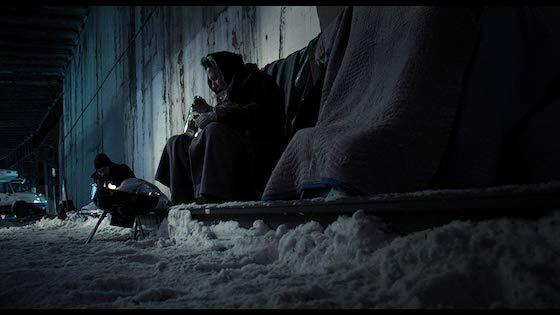 He is on the streets with the sound of the L train as his only anchor to a reality that seems to be crumbling around him; there are shadows – mounting shadows – and with them comes a great disappearing act: something is taking the homeless of the city and draining them of their blood. Vampires. That is the pulpy subject that is the center of Hunter’s heart and, with a mix of streetwise antics and The Godfather-esque demands, we have a film the merges several genres together into an award-winning flick that will satisfy MORE than just Horror Hounds. 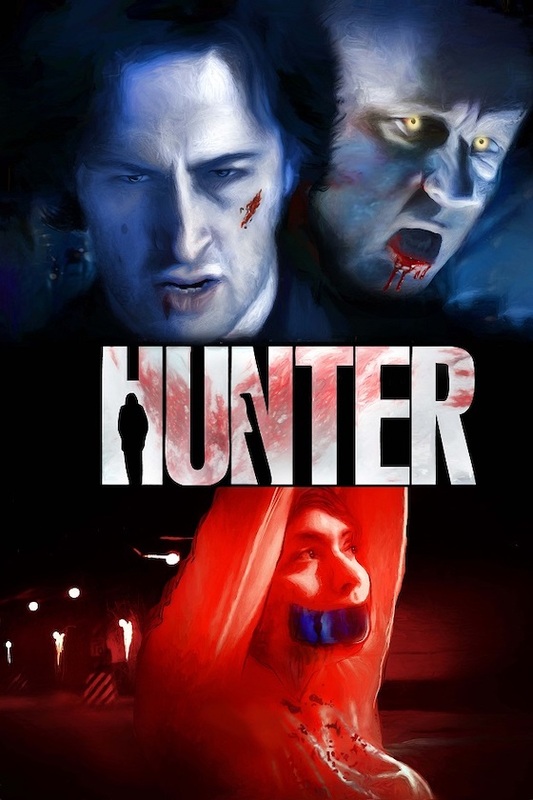 Hunter, directed by David Tarleton, brings the heat; it is city-themed, edgy as hell, and delivers a brutal takedown of the undead. In it, Searcy plays a head Vampire named Volakas and he, putting the pressure on the youngest of his clan, Luke (Ryan Heindl), to do better and be powerful has issued an edict that will definitely rattle hollow skulls: kill or be killed. Luke is berated by other undead thugs, but paths will cross when Hunter, already reeling from the physical and mental abuse of all his past fights, takes his emotionally damaged self on a mission to search and destroy in order to bring his therapist, Danni (Rachel Cerda), who has already helped him regain a bit of his lost self, back to safety. His fight, pushing his body to ignore the pain, is not quite over yet and what he brings to the undead is more than just fists of fury. He might be smaller than most MMA fighters, but his takedowns are just as brutal. Distributed by Random Media and winner of Best Feature at The Manhattan Film Fest, FreakShow Horror Fest, and Lift-Off, Hunter’s release date is set for Feb 12, 2019 on all digital platforms. Emotional, street tough, and blood-soaked in all its fanged fury, do NOT miss this new definition of a blood sport! Memorable Movie Quote: "Do you ever hear voices or see things that other people can't?" Synopsis: Driven to the brutal, winter streets of Chicago by demons real and imagined, a young man grapples with the horrifying truth of the supernatural figures that killed his family, to rise above being the victim and become the HUNTER.